Survived the grandson's 30th birthday party. Always interesting to talk to my first husband who shows up at these events. We would have been married 54 years, but it only lasted 5. The girls sat on either side of him and as always their strong resemblance to him strikes me. And, as always I breathe a sigh of relief that I got out of that relationship and grateful for the two children we made. My niece from Dallas breezed in the next day and we spent time here with Erin, Anah, and Tracy. We reminisced, dove deep into the whats and whys of life. Menopause and its various manifestations was a big topic. Anah and I had no interest being at the opposite ends of life. 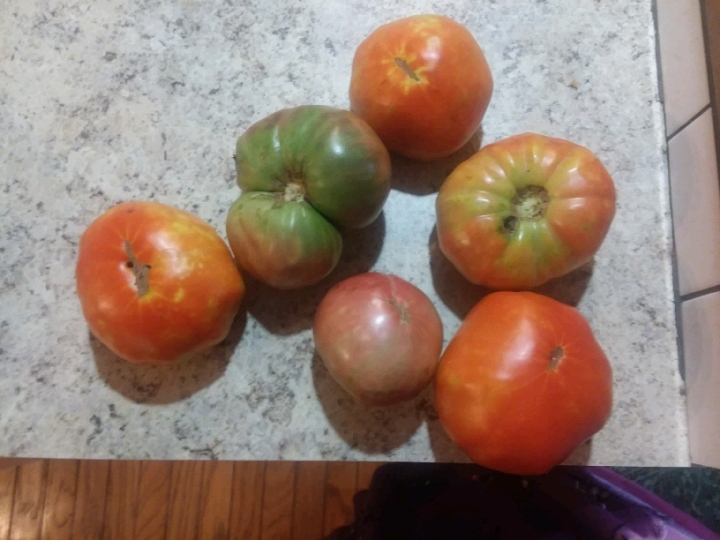 Getting some nice tomatoes now, still cukes and zukes but not too many. The drought continues as does The heat. The beetles have recently attacked the corn, munching away at the silks. Only if they had already pollinated will there be kernels. Trying to keep the blasted bugs under control using traps which fill up every day. Just too many of them. Another imported species, brought from Japan in 1916 in potted houseplants. 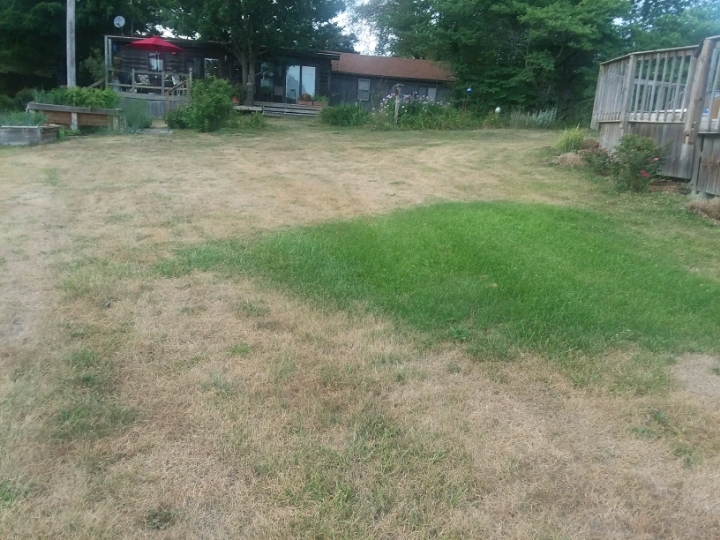 There is one bright green spot in the midst of all the dead grass. It's signals that there is a leak in the pipe that runs from the pond to the house. The husband says he'll fix it after the weather cools off. Finished "Just Kids" by Patti Smith. The memoir details her relationship with Robert Mapplethorpe. Lots of interesting info on the NY art scene in the 60's and early 70's. I spent a lot of time researching the players. Watched a documentary on Mapplethorpe, listened to some Patti Smith on YouTube and totally enjoyed the entire experience. Tracy and Lainey are coming to spend tonight here. Tracy, aka daughter no. 2, is shadowing a job here in town. After working for State Farm for 35 years her job is being moved and though near retirement she must seek other employment. Got in the pool with Anah yesterday and swam just a little bit, but enough to make my neck wonky and produce a headache this morning. I love to swim, sure hate to give it up, but it's trending that way. During a brief spurt of creative energy I got out everything needed to mosaic a bottle, but haven't started yet. Had a great video conversation with grandson, Dylan. He hates the cost of living in Austin, but loves the creative opportunities.Talks about moving back to Missouri. Reading "Fates and Furies" by Lauren Groff. Wanting the new Joni Mitchell bio. Yeah, green grass this time of year is a sign of water not where it's supposed to be haha. I'm glad to see that people in other parts of the country let their lawns turn yellow in the summer. When people come to Seattle and see that it's a common thing here, we get criticized. It's downright unAmerican! Really it's practical. It saves water, and you don't have to mow during the hotter months. When we were in Colorado saw a lot of lawns being stripped of grass and replaced with mulch and rock paths with a few grasses. I liked that a lot. Lawns are so unnecessary imho, and we have a huge one. Have turned a lot of it into meadow like areas. Yeah, I think it's good that laws are growing out of fashion in parts. I heard an interview with Mapplethorpe’s sister about that same book yesterday. It was fascinating. The drought this year is terrible. They aren’t calling it a drought officially yet, but we have had an inch of rain since the beginning of June. He seems to have been a bit of jerk, but I I think that comes with the territory of being so driven. I'd say we probably have had about the same amount of rain as you have had. Everyday I look at the weather report and I'm hopeful but then the rain just passes Us by. Mmmm. Eggplant casserole sounds about right! Well it was a long time ago and I was only 16 when we married so all is forgiven. Good to catch up! Sounds like you've been very busy! I will keep my fingers crossed for Tracy. I'm finding myself in the same boat job hunting! Hope you are both successful, it has been a real stressor for her. Ooh, eggplant casserole! May I have the recipe? lifeinroseland gave me Fates and Furies for my birthday last year. I liked it.. I'm envious of your eggplants. I chose the book because you liked it, always on the lookout for new reads and it is keeping me entertained nicely. The eggplants must like this wretched weather as they just keep on giving. I've never had such great success before. That pic of the flowers is beautiful. It's good you can hold a conversation with your ex. Menopause, isn't that just a peachy topic? I do think it's good to hear other peoples experience with it, though. Just to know others are going through the same thing, or worse, actually helps. The flowers have somehow managed to bloom in spite not getting any rain. 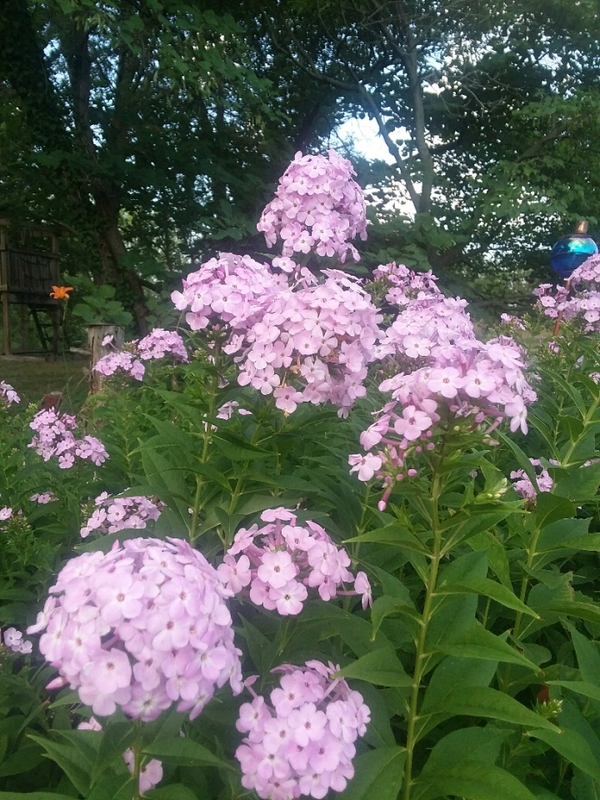 They are garden phlox a gift from my husband's grandmother long ago. Yes, I think the girls like to compare their menopausal experiences if for no other reason than to make each other feel better. Out grass is drying out here too. In the spring and early summer we had so much rain everything was such a vibrant green. Now when we’d like more rain, no such luck. Menopause has been a topic amongst my friends recently as we are all nearing that time with some us already experiencing some signs and changes. My brother used to live in Austin and boy has the cost of living there really jumped in the past few years. It is a great city though. We really didn't have a spring at all it just jumped from Winter Into Summer and long with that the rain went away. I try as best I can to share my experience of menopause which is now about 20 years in the past but I forgotten a lot. Oh, eggplant casserole for breakfast - yum! My goodness, you have a grandson who is 30? My mind boggles. How will I cope with my eldest gradkids being twice the age they are now if I am still around. Sounds like you are having nice family time of one kind or another. That would be sad if you had to give up swimming. Sometimes I hurt my neck, but mostly I go okay, so far. Could you adjust your mode of swimming or maybe just go in for a dip ie get wet but not actually swim in the position that causes the trouble? And I don't blame your hubby for waiting for it to cool off. That looks like some back breaking work coming up. Oh, and I have an ex who I have to put up with at some family events. Yes, we have two beautiful daughters. And yes, we do keep it civil. I have a granddaughter who is almost 33. I do miss having the little ones, but hoping that but hoping that the grandson will soon marry and we will have babies around again. I do get in the water and walk laps around the pool and need to do more of that. I sure do wish it would cool off, tired of being inside. But the heat wipes me out. I know what you mean about too hot to think! Or do anything! Glad you can still get in the pool and do some exercise. I'm not sure if I want to think about grandchildren being 30 or more! It would be nice to have more babies around though, I agree. Dad was counting up his great grandkids the other day. I know he has about 20 grandkids. The mind boggles. Oh my 20 grandkids, my mind is boggled. I have 8 and can't keep up with them. I would imagine eight would be quite enough to keep up with. I have five so far. I love your perspective on your marriage and children. I read Just Kids a few years ago and ended up going to see Patti Smith speak when she came to my university, and going to the Mapplethorpe exhibit at LACMA when it was there. I felt so much more informed because I read the book! I will be 72 in November. Lucky you to see Patti and the Mapplethorpe exhibit. I think I would have found the exhibit disturbing. Did you? But certainly the book eould have added depth and understanding to the visual. wow! so you married young. I guess parts of it were disturbing, but other parts weren't at all. I'm glad I got to see it!